Hadad Bros. 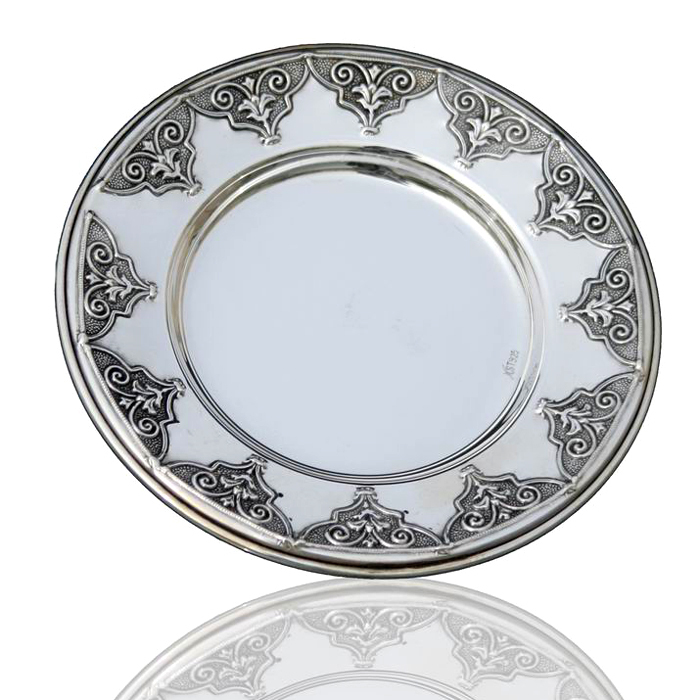 Silversmiths created this 925 Sterling Silver Saucer to go with your choice of our Kiddush cups or goblets.Made in Israel by Jewish Laborers.Total Wt 47g. Arabesque trianglular designs create a starburst effect border around this elegant saucer that will compliment any Kiddush cup or goblet of your choice.+As only Jewish artists created this item, there is no need to Tovel [immersion in a Mikvah] it.+Diameter of Saucer: 12 cm [approx 4.7 inch] +About Hadad Brothers Silversmiths:+…it all began by the silvery glow of a lantern, as Grandfather Hadad forged, engraved, decorated, and adorned another one of his unique masterpieces. In those days, everyone knew that an exceptionally beautiful silver piece could only be obtained from the Hadad family, and each client would arrive at the artist's workshop, with his own heart's desire, to witness Grandfather [aka Rabbi Shalom Hadad] fulfilling his precious dreams. From then on, the name of Hadad Bros. became synonymous with pure silver pieces, boasting a longstanding tradition of artistry and quality.+Hadad Bros is a family run company that has been in business for three generations. The current factory was opened in 1964. I contacted Avi with a problem, and he was on the case immediately and was very responsive and knowledgeable.